St. Paul of the Cross has a well maintaned campus that lies across two city blocks. Our campus includes three parking lots, two school buildings, a rectory, Church, Ministry Center as well as a centennial garden where vegetables are planted for our food pantry every spring. All buildings on campus are air conditioned. Handicap access to the church is provided by an exterior ramp on the west side of the church. The Morello Parish Life Center is also handicap accessible. 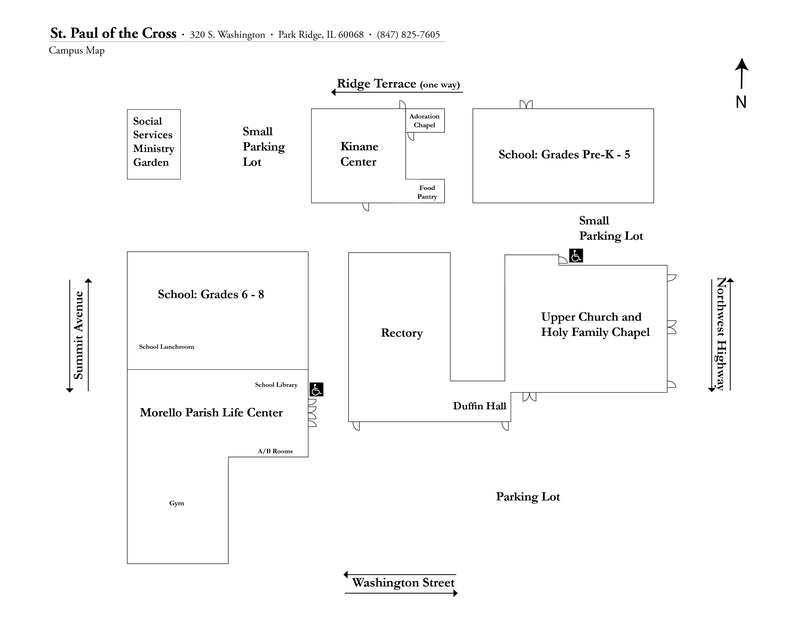 A comprehensive list of parish meeting spaces can be found below. Campus meeting rooms are strictly reserved for parish related events. Sacraments at St. Paul of the Cross receive priority. If you are part of a parish ministry and would like to reserve a meeting space contact Michele Yarbrough. • If a special set up is needed for an event, serving of food, or audio visual equipment is required an Event Set Up Form needs to be completed two weeks prior to your event. • The number of attendees and overall size of your event should be proportional to the facilities you are requesting. We may suggest a different venue if your event can be accommodated in a smaller room. • The maximum occupancy refers to the limit on how many people are allowed to occupy a room while standing or seated in chairs. This number decreases with each table that is set up. • You will be responsible for proper disposal, clean up, and removal of all food, beverages, and decorations at your event. • Access to keys cannot be granted without approval of your event. Keys must be checked out from the parish office the day of your event, must remain on campus, and need to be returned to the parish office after your event. • You will be given up to two hours prior to your event start time for set-up. Exceptions to this policy must be approved by the business manager or the pastor at least one month prior to the event. • Fire exits must have five feet of clearance from all set-up and must have a clear path. • Lights must be turned off following your event, windows and doors must be locked. We are required to obtain a Temporary Liquor License from the City of Park Ridge if we are serving alcohol at a parish or school wide event. If alcohol will be sold at an event we are required to obtain temporary liquor license from the state, in addition to the license from the City of Park Ridge. If you are not sure if a temporary liquor license is needed please contact Michele Yarbrough. The event coordinator will be responsible for signing a form for the City of park Ridge to make sure that no one is over-served. This form will be included in the aplication materials. If alcohol will be sold at your event we will also have to apply for a State Liquor License. This process takes an additional 2–3 weeks. Please contact the parish business manager, Joan Macpherson, if you have any questions. - Duffin Hall is not handicap accessible. - No tables and chairs (guest seating) can be set up in the kitchen area. - Because this space is primarily for worship, use of this room is restricted to religious events only. - Special set ups are not permitted in this room. - Food and beverages are not permitted in this room. - Special set ups are not permitted in this space. - Food is allowed on a limited basis. Kitchen may not be used for food preparation. - TV / VCR / DVD - available in this room with a work order. - The Kinane Center is not handicap accessible. - Food and beverages are not permitted in this room. Water only. - Special set-ups are not permitted in this room. - No events/meetings during school hours. - TV / VCR / DVD - available at all times for use in this room. - No tables and chairs (guest seating) can be set up in any hallway. - You may set up registration/check-in tables against the walls in the hallway as long as they are 8ft. rectangles and not 5ft. rounds. - The kitchen area is restricted to adults. - This space is primarily for worship. Use of this room is restricted to religious events only.